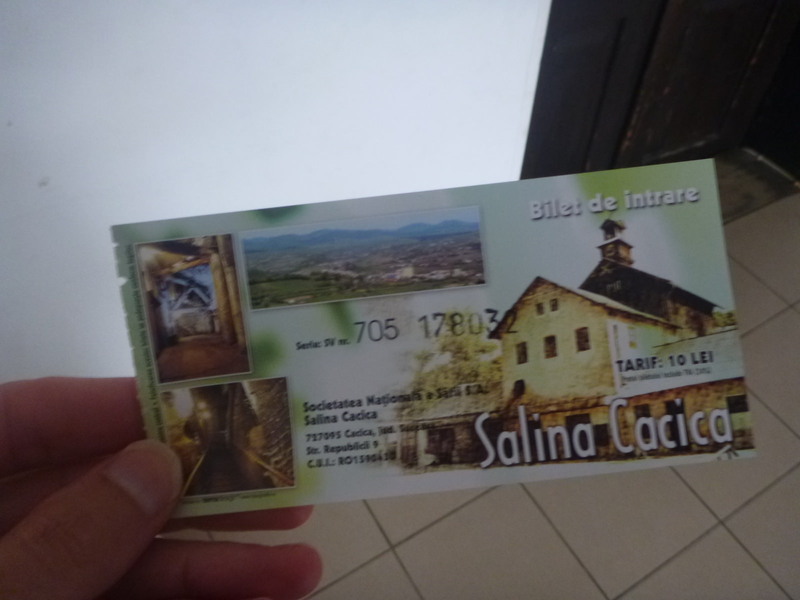 Touring the Underground Salt Mine in Cacica, Romania. So I’ve visited mines before in Bolivia and New Zealand. 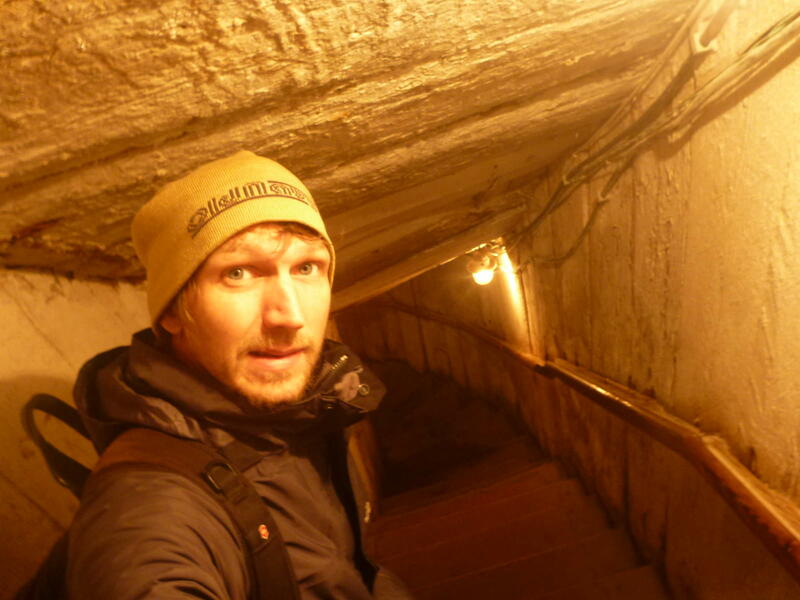 I’ve stood on salt flats in Iran and Bolivia , gone underground in Turkey in Kaymakli but all those memories were about to be joined by an exciting and obscure new one. 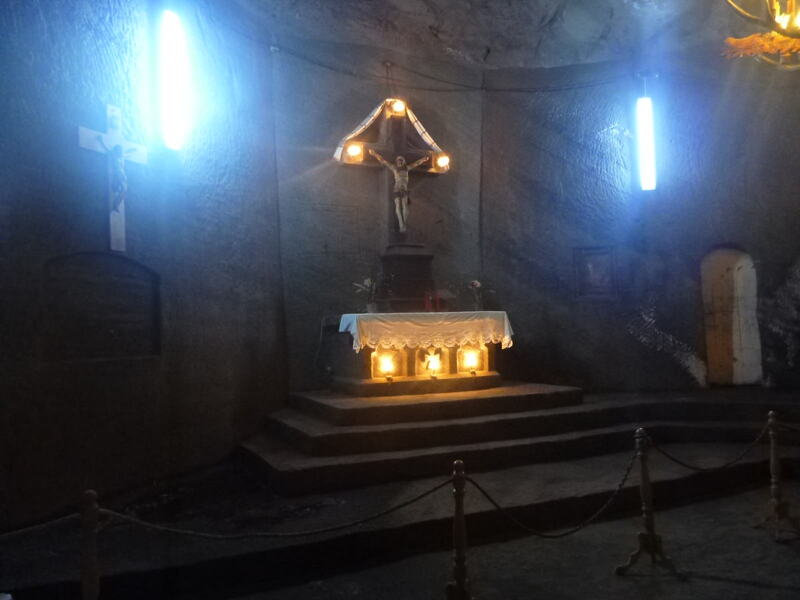 While backpacking in Romania, I ended up visiting an incredible underground salt mine in the barely known town of Cacica in the north of the country in southern Bucovina (for the record – northern Bucovina is actually in the Ukraine). This is no ordinary tourist trip. This is off the wall stuff and I highly encourage a trip to this part of Romania. 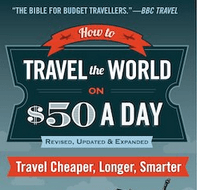 You’ll be amazed, mostly by the fact there are no other tourists and you can’t work out why. 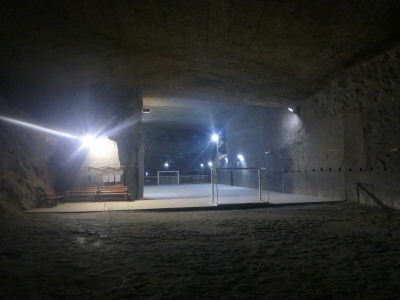 The Cacica Salt Mine is in Bucovina, Romania. 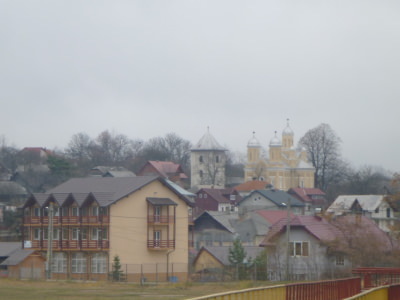 It’s a town in northern Romania. 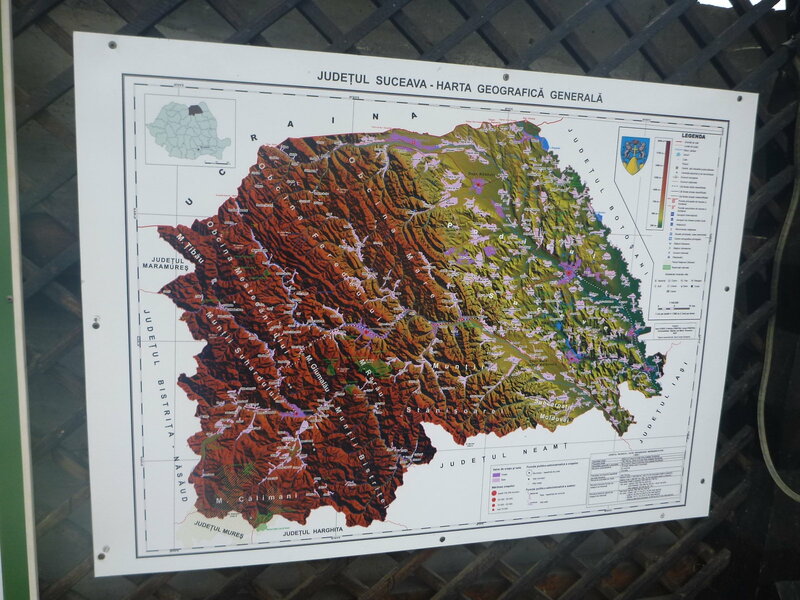 It’s in the region known as Southern Bucovina so it’s not too far from the Ukraine border. Cacica has a population of 1,408. It’s got some really cool buildings in it, aside from this salt mine I’m writing about. Tourism hasn’t taken off in Romania the way it should have done, which means getting to Cacica is not that easy. I’m just telling you how it is. The best way to do it realistically is to hire and car and drive there yourself. This is actually probably the best way to see Romania. However, I got a double train up to this region. I first got a train from Bucharest to Suceava, then a train to Campulung Moldovenesc (where I stayed in the Dor De Bucovina hostel). From there I actually went on a tour of some monasteries in the region which was organised for me. So if you are not driving, you can ask tour operators in Campulung Moldovenesc to add Cacica into your itinerary for the region. Please don’t miss it if you’re in the area. 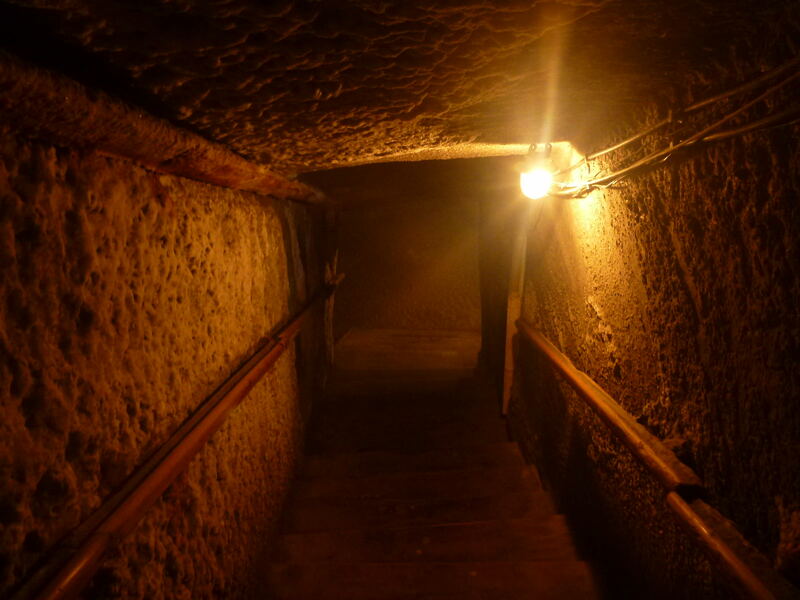 Though if you do miss it, there are similar underground salt mines at Praid and Turda. 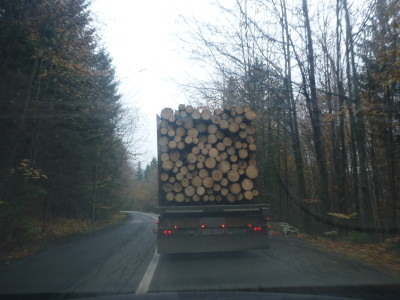 The charm of the drive to Cacia – rural Romania at its best, stuck behind a juggernaut of logs. 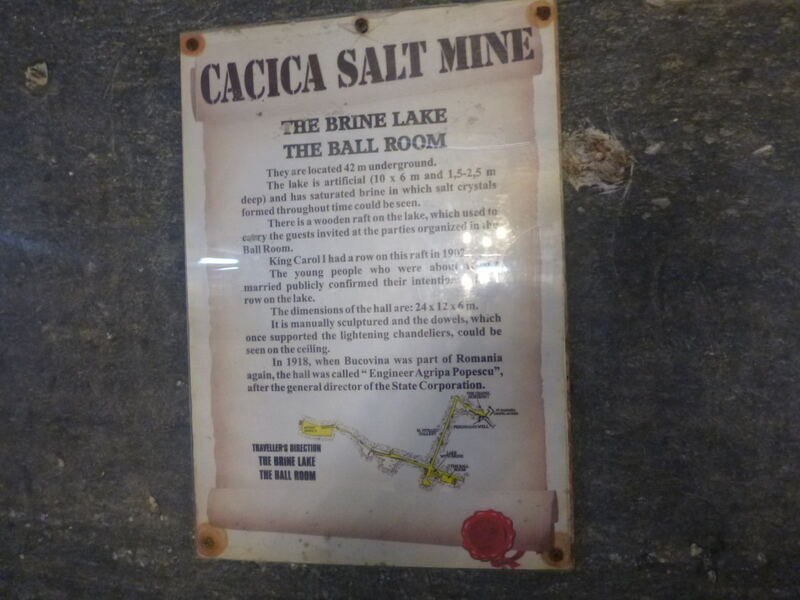 When does the Underground Salt Mine in Cacica open? The opening hours are from 9am – 5pm daily. 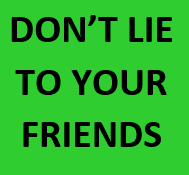 Though I have heard that this is not always the case – please check things in advance – they have been known to close at short notice and have days where the only way to know it is closed will be to go there. 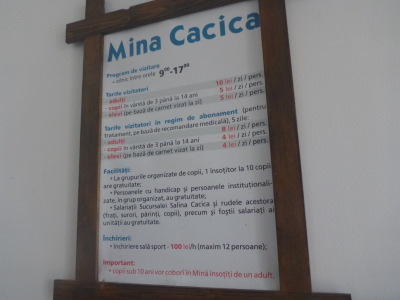 Opening times of Cacica Mine. 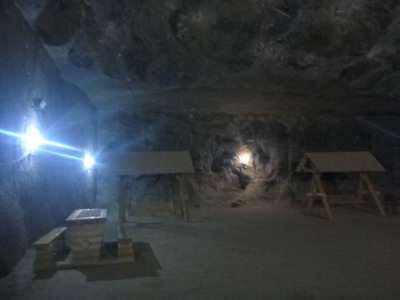 How much does the Underground Salt Mine in Cacica cost? Ticket for the salt mine in Cacica – 10 Lei. Cacica preserves archaeological vestiges that are over 5,000 years old. Due to the local salted water sources, the monks of the Humor Monastery erected here in the time of Stefan the Great, organised the supervising and exploitation of salted water. Cacica developed extensively under the Austro-Hungarian Empire when, after the discovery of the rock salt deposit in 1790, the salt mine was built. 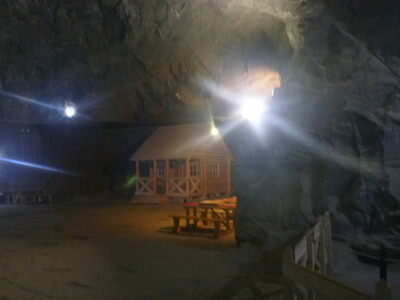 The mine soon attracted many settlers of Polish, Slovak, Ukrainian, German and Transylvanian origin. The descendants now form an active and captivating multicultural community. 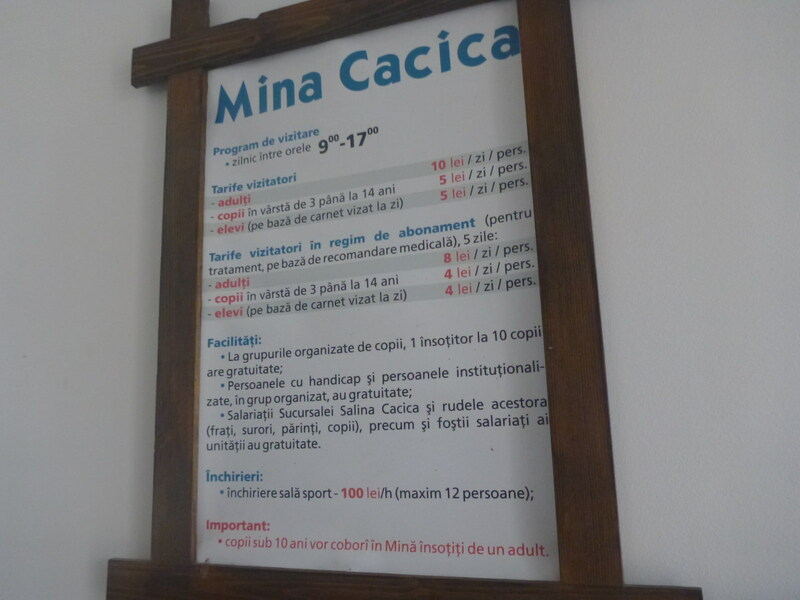 As you get deeper down in the mine, information boards at various intervals provide informative and welcome information in a few languages, one of which is English. 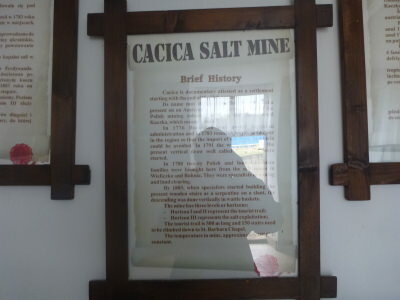 A brief history of Cacica Salt Mine. First of all – I took some water in with me and I’d recommend it. 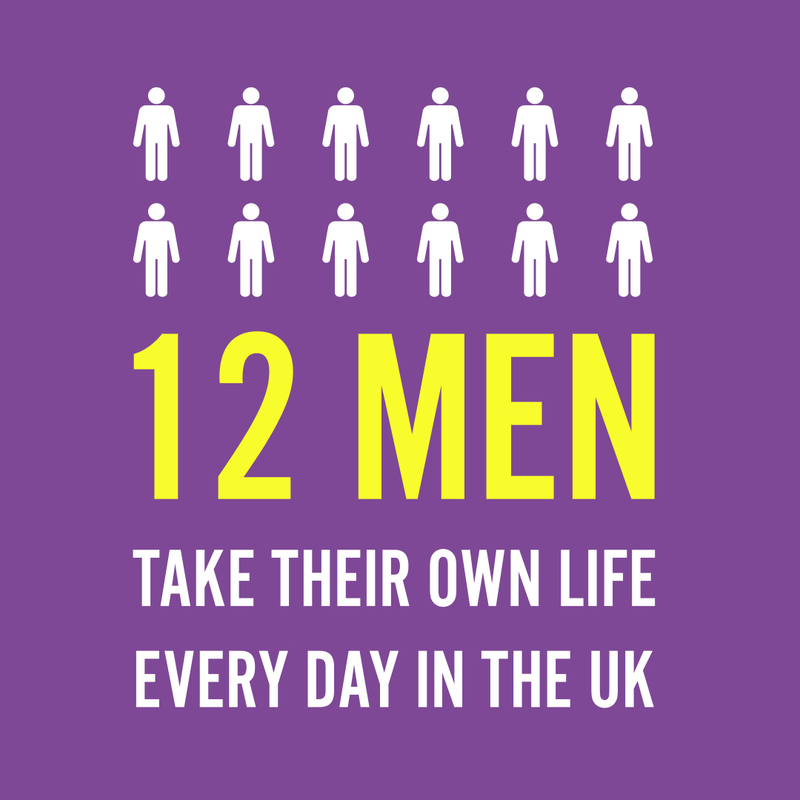 There is no fresh air as you are going underground here and no daylight so those who get claustrophobic please consider this before you head down. The first part is the steepest – lots of downward steps, some of which are slippy so be careful too. Once you are down the first part, you enter a massive room. This came as a big surprise to me as I expected it to be deep and narrow all the way! Starting with this room (a church) here are the main sights inside the Salt Mine in Cacica. 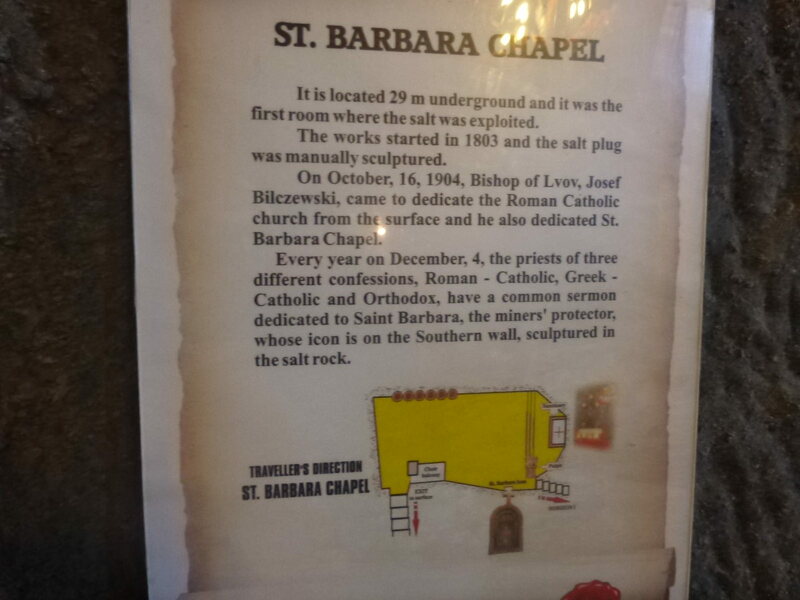 At 27 metres below the surface is this church, St. Barbara’s Chapel. 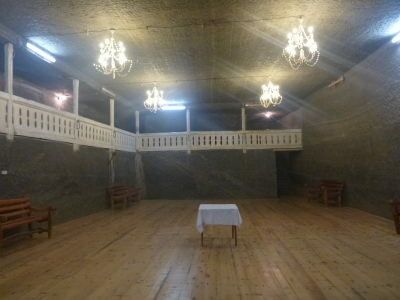 This is the first room where the salt was exploited. The work started in 1803 and the salt plug was manually sculptured. It’s a work of human hard work and art. 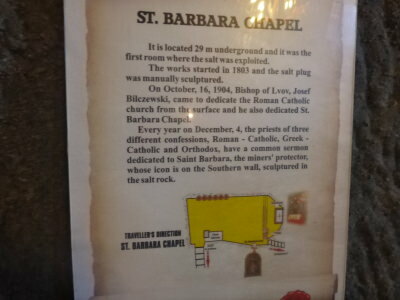 Every year on the 4th December, priests of three different confessions, Roman Catholic, Greek Catholic and Orthodox have a common sermon here, dedicated to Saint Barbara, the miners protector, whose icon is in the Southern Wall, sculptured in the salt rock. A bit further down some steps and along a corridor and you come to the salted lake! It’s not actually a natural lake but the salt is natural of course. It/s 38 – 42 metres below the surface. 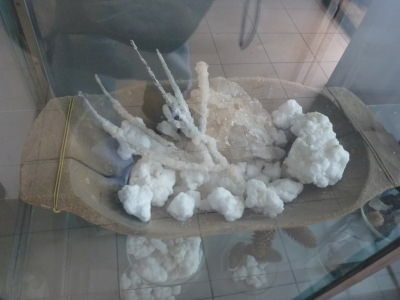 The lake is artificial and has saturated brine in which salt crystals formed throughout time could be seen. This is crazy, here underneath the ground is a ball room – incredible! With a balcony looking over it, chandeliers and a dance floor you can’t quite believe it. This would be a totally cool and crazy place for a party – no wifi, no worries about weather, and no escape unless you climb back up the steps 40 metres to the surface! 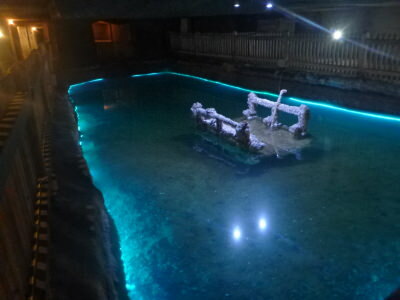 OK so that might not be the real name for it but with sunbeds, wide open spaces and safety from the world outside, this grotto part of the underground salt mine is the final room you get to on the tour and it feels like a party zone. All it’s missing is a wee bar in the corner, football on the TV and a bowling alley. Well you know what I’m going to say – this was the highlight here for me. Some 70 metres below the ground here is an indoor 5 a side football pitch with nets and pitch markings. There’s even room for spectators on the two sides behind the goals! Yes! 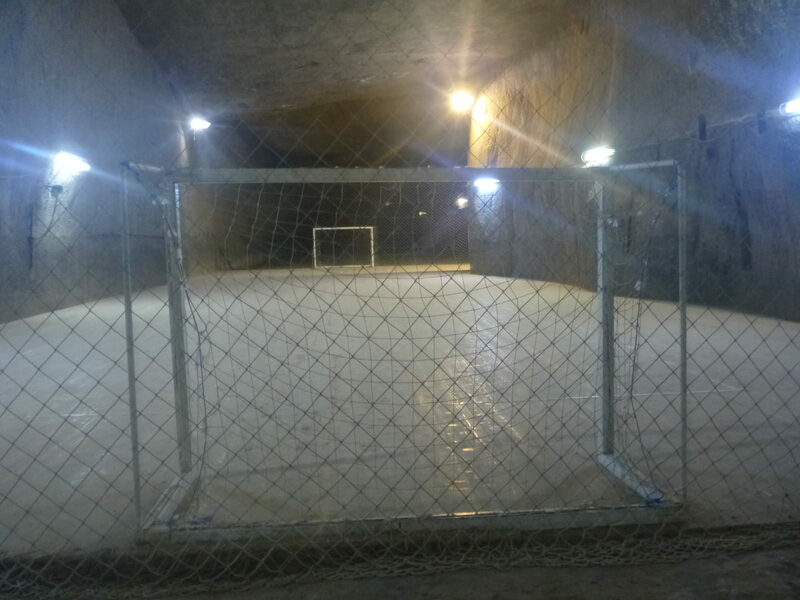 It’s an underground football pitch. Having previously visited the world’s highest national football stadium back in 2010 in La Paz, Bolivia, I wondered if this was one of the lowest football pitches in the world. I was in Romania for the Northern Ireland v. Romania match that week so it was nice to visit this place and fly my travelling NI flag. 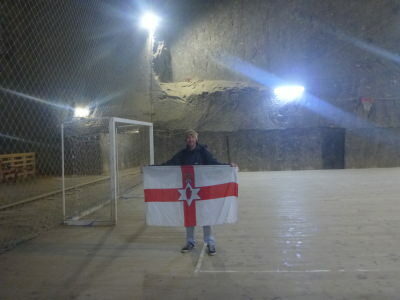 Northern Ireland flag on the pitch here in Cacica Salt Mine. As well as the information boards along the way and some souvenirs, the tour also includes a small museum on Cacica. 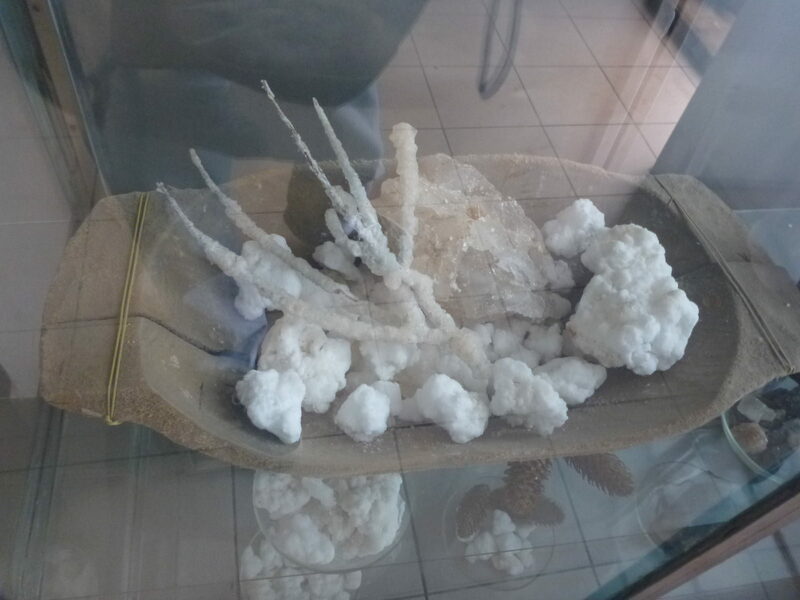 Salt artefacts in the museum. All in all, I am so delighted to have got this one written up and to help promote it. I sincerely hope if you’re reading and enticed by Romania you are going to come here to Bucovina and tour places like Cacina, Marginea and Sucovita. Make sure you base yourself in the town of Campulung Moldovenesc which has direct trains to Bucharest (including a handy night train option) and stay at the Dor de Bucovina hostel. This entry was posted in Bucovina, Cacica, Europe, Romania. Bookmark the permalink. I DESPERATELY want to do this, any excuse to crack out the geology degree! Worth trying Turda Salt Mine, is not far from Cluj-Napoca city, in Transilvania.